For some people, it can feel very tempting to invite hundreds of people to the ceremony. Howver, with each addition to your guest list, you’re adding a person that’s of lesser importance to you compared to the people you’ve already invited. To a degree, this was a trap we fell into with our own wedding – our guest list grew and grew to the point where we invited people that we didn’t know well simply out of a sense of obligation. Instead of just adding more and more people, consider inviting fewer people and making the event more intimate. Try cutting your list in half and see if you’re happy with it. We were lucky that several of our friends and family had musical talent, so they were able to provide musical accompaniment for our ceremony. We also have a close friend who is an extremely skilled amateur photographer and he was willing to serve as photographer for our ceremony as our wedding gift – after the ceremony, he provided high quality digital images of everything. 3. Have the ceremony at home, or outdoors. 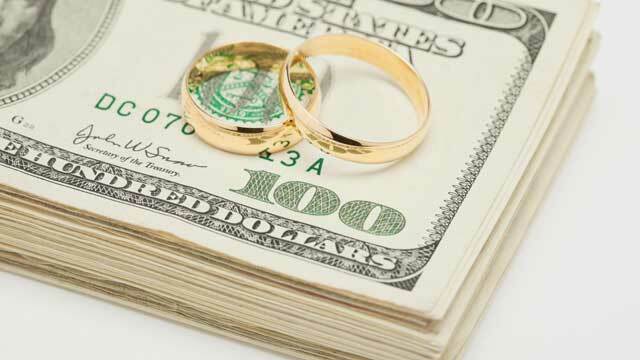 You may find that the cost of renting a building for your ceremony and reception is expensive. Instead, consider using your own home (or the home of a parent) for your ceremony, or perhaps a public park with a beautiful view. In each case, you can also have your reception outdoors, often eliminating the cost of renting a place as well as creating a memorable ceremony. For our wedding, we handled our own food preparation and catering with a lot of help from my wife’s family. This drastically reduced the food costs for the ceremony. If this isn’t your forte, look around your community for a family-owned restaurant and ask the owners directly to cater your wedding. Family-owned restaurants are always the first place to check – they will almost always go the extra mile to make your wedding special and will also charge a reasonable rate. Instead of having huge piles of flowers everywhere (something that will only really last for an afternoon), instead simply go with a single rose for each bridesmaid and a very small bouquet for the bride. If you know someone with a rose bush, you can actually easily make your own bouquets the day before the ceremony by cutting the roses yourself and trimming away the thorns. 6. Choose very personal books for groomsmen/bridesmaid gifts. It’s often customary to give gifts to one’s bridesmaids or groomsmen. One very effective (and frugal) gift is to give personally important books to each person. Choose one that expresses something personal that you feel is appropriate for each member of the wedding party and hand-write an inscription on the inside, noting that the gift is for the wedding and why it’s an appropriate book. 8. Use a good home stereo system for the reception music. Rather than hiring a DJ, just use your own home stereo (or the stereo of a close friend). Put speakers around the dance floor area – there’s no need to spread them around the reception room. Then just create a few mix CDs from your own collection – there’s all the music you need. 9. Have “vendor cards” in exchange for reduced rates. If you’re hiring people to provide services for your reception (musicians, a DJ, florists, caterers, photographers, etc. ), offer to advertise for them in exchange for reduced rates. At the reception, put a small card in each person’s place that lists the businesses responsible for each service at the wedding, along with their contact information. Since this tends to be very effective advertising, many businesses will happily provide services at reduced rates in exchange for this opportunity. 10. Contact the local university for musical accompaniment needs. If you’d like live musical accompaniment for the ceremony (and perhaps for the reception), one place to look for low-cost musicians is at the local university’s music department. Contact them and ask if there are any students who are studying a particular instrument or vocal work and see if they’re available to provide music for your wedding. It can help them with their resume and save you on this part of your wedding. 11. Patiently shop for any decoration needs. Michael’s, Paper Warehouse, and Hobby Lobby all have sales somewhat regularly throughout the year – and they all sell supplies that can be helpful with your wedding. Know what you’re looking for as far in advance as possible and let the sales come to you. Michael’s in particular is a good place to shop, since they often have very strong coupons in the Sunday paper that are perfect for wedding decoration supplies. 12. If you’re getting married in the church you’re a member of, ask the ladies’ auxiliary for help. Most churches have a women’s organization that is very happy to help with wedding preparation in exchange for a reasonable small donation. Get them involved – they can take a lot of worry off your shoulders for a relatively low price. At our wedding, the “church ladies” were a great help with church decoration and other helpful things on the day of the ceremony. 13. Buy dresses together when a sale is on. Similar to the tip for shopping for decorations, you can often save a significant amount of money by shopping patiently for dresses as well. Many dress stores have sales on holidays such as Memorial Day – keep an eye out for such sales. You may also want to shop together so that you can all save during the sale. 14. Rent tuxedos as a group. Unless you have a specific reason for owning a tuxedo (and few people do), you should rent one. It’s often useful to rent the tuxedos as a group through the same business, as you’ll often get a group rate. It’s often useful to rent through a place that’s fairly close to the site of the wedding so last minute adjustments can easily be made. 15. Make a simple honeymoon, not an ostentatious one. A huge, over-the-top honeymoon might sound fun, but it’s far, far cheaper (and often more enjoyable) to have a much more laid-back honeymoon. Instead of planning a big trip, just hop in the car and spend a week or two together just driving around and enjoying being married. The fewer plans, the better – and the cheaper. 16. Involve your closest friends and family in the preparation. As you’re developing plans, you should get your closest friends and family involved with the details. Quite often, they’ll have surprisingly good ideas that can save you money and effort – perhaps they’ll know someone that can cut you a deal on a certain part, or maybe they’ll just volunteer to help out with that piece. Good friends and family are always there to help, so you might as well use it. List everything you can think of and walk through these items step by step. The earlier you get started – and the more things you think about early on – the less “last minute stress” you’ll have and the more time you’ll have to find sales and discounts and other good ideas. Something will probably go wrong at the last minute – a little detail of some sort won’t work out. For us, the pastor almost missed our rehearsal dinner, so we barely rehearsed. Don’t worry about it – just assume something little is going to go wrong and don’t respond by throwing cash at it. Most likely, no one will even notice the little issue, and quite often someone in your wedding party (or someone helping out) will come up with a pretty good solution to fix things.